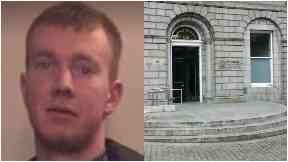 Jed Duncan fled from security guards at Aberdeen Sheriff Court on Wednesday. Jed Duncan: Understood to have travelled to Woodend. A prisoner has escaped from custody outside court in Aberdeen. Police Scotland has launched an investigation after Jed Duncan absconded from G4S security at around 11.40am on Wednesday. The 24-year-old fled from outside court and is understood to have travelled to the Woodend area of the city. It is believed he was seen near Woodend Hospital at around 12.40pm. Chief inspector Neil McDonald said: "There is nothing to suggest there is a wider threat to the public however we would urge anyone who knows where Jed is to contact us immediately. "Jed is described as 5ft 9ins in height, slim build and is known to have been wearing a black beanie hat and dark clothing. "Police can be contacted on 101 or Crimestoppers on 0800 555 111. In an emergency always dial 999."